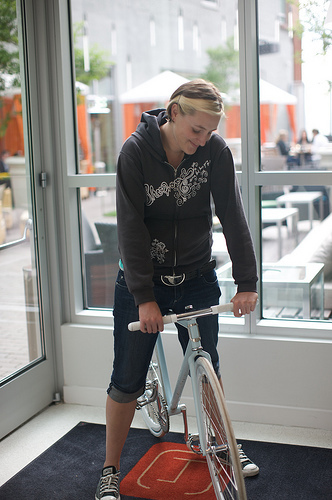 This is Amber, she’s the project engineer for the Globe line of bikes, which we’re evaluating this week at a Specialized-sponsored press event. What I love about this shot is how much she’s clearly glowing while she sits on a bike she designed from the bottom up. There are a ton of great details on this bike (and you can check them out on my flickr site until we move them over to the Hugger page). Check out the hubs, grips,saddles and other standout details.